knowledge and ability to undertake the task. 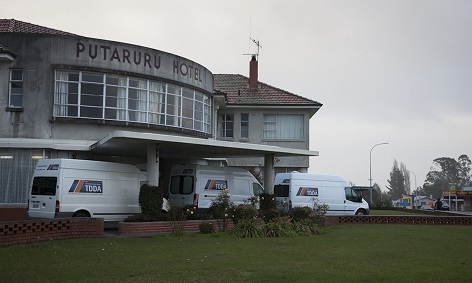 The workshop was held at the Putaruru Hotel from 6:00am and as the sun came up, it became obvious to the locals that something was going on because it’s not every day there are three ‘The Drug Detection Agency’ (TDDA) vans lined up in front of the local drinking establishment. 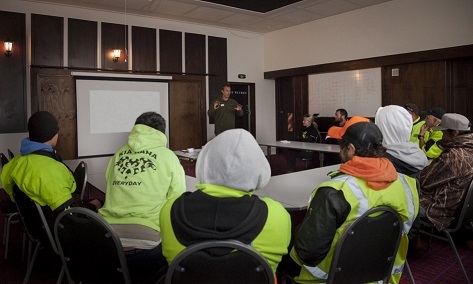 An area of attention for the 2016 planting program is a drug free worksite and workers understanding the risks of drug usage. TDDA performed pre-work Drug and Alcohol screening tests on everyone attending the workshop. However, this wasn’t the only focus of the day, there were four one hour sessions of training that the planters attended. PF Olsen’s Health and Safety Manager Nic Steens facilitated a session on hazard identification and risk management. Nic discussed incidents from past planting seasons and the learnings from those. 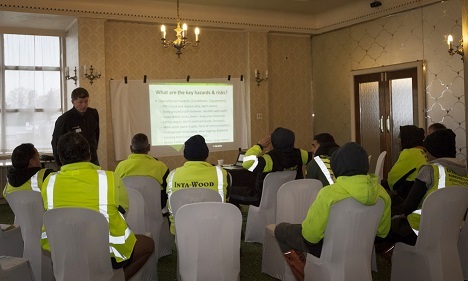 He also talked about travelling to and from the worksite and touched on a topic WorkSafe NZ is promoting – ‘Health on Work and Work on Health’ also known as ‘fit mind- fit body’. Jason Whatuira took the workers through another session. Jason has been working with PF Olsen crews for around two years and has diverse experience educating groups from all walks of life, including professional athletes. He has a genuine affiliation with forestry workers and is able to provide an insight into the decisions people make, ranging from daily work decisions to big life decisions. He helps equip individuals with resources and techniques to make those decisions in a positive and less risky manner. There were demonstrations of planting skill, techniques, and quality control. These took place in an empty section next to the hotel. Everyone had to demonstrate they understood the planting process culminating with planting a seedling to a high standard. Bill Tiopira from Waiariki Institute of Technology introduced planters to the unit standard they will be working towards during the season. After lunch the crews left to spend the afternoon on their first planting job of the season. Everyone involved is looking forward to a safe and productive winter of planting forests, which will grow to sustain future generations. To incentivise the workers to stay drug free and to turn up for work each and every day, PF Olsen, in consultation with its key clients, has included a reward system which centres on a number of key performance indicators. All individual workers will be randomly drug tested once a month throughout the duration of the planting season. Individuals producing a clear test result and good attendance record are awarded a grocery voucher that is sent to the workers’ home address. We have already dispatched the first round of vouchers and have had positive feedback from crew and their family members. The programme so far is working exceptionally well with significant improvements in drug test results, work quality, crew production and worker attendance. This is pleasing for both PF Olsen and our clients who are generously supportive of both the workshop and incentives.